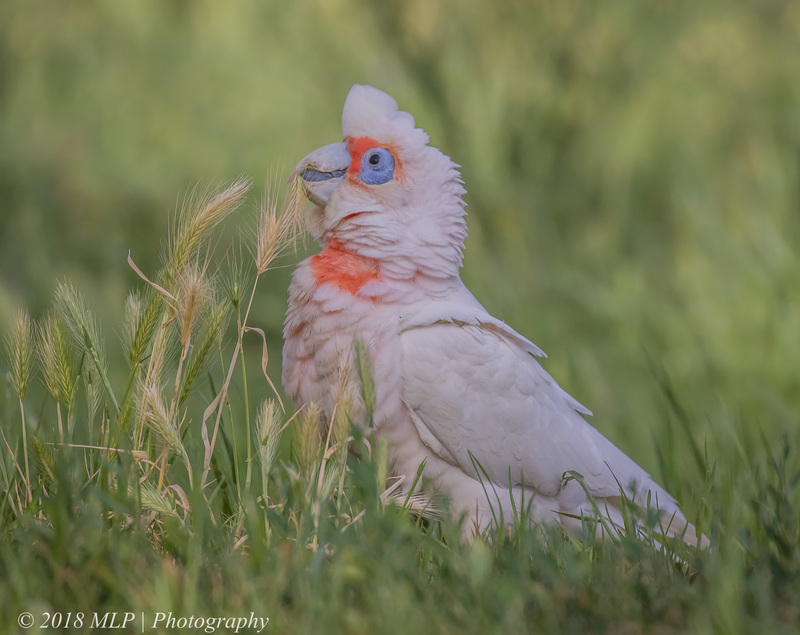 A sunny late afternoon walk along the creek produced the usual array of local birds, many with new families. 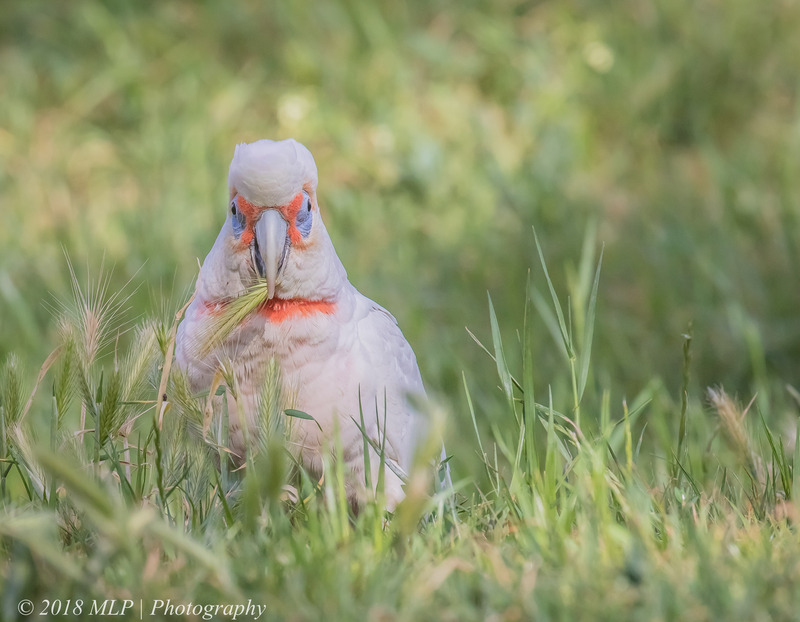 We watched a pair of Long-billed Corellas feeding on grass seeds and later found a snoozing Cockatoo. 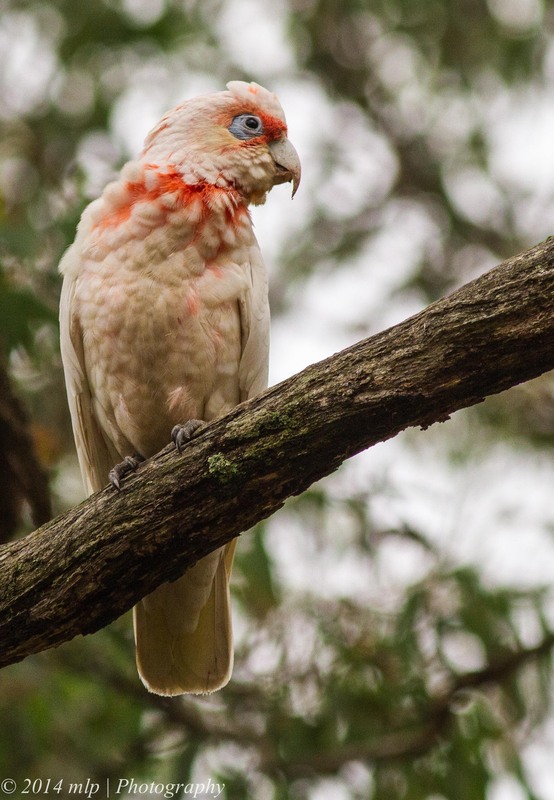 It turned out to be One-eye, the partner to an escaped or released Cockatoo still wearing a cage leg ring. 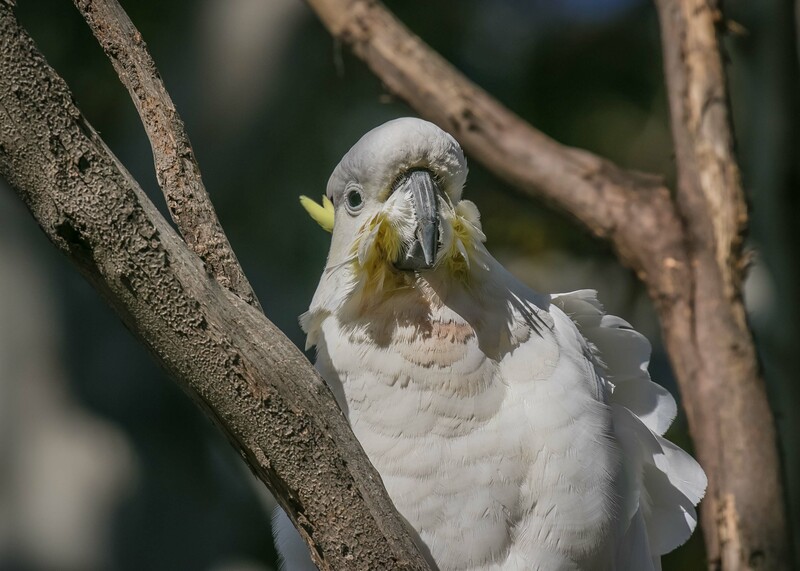 This couple has now bred in the same tree two years in a row and currently there are several chicks inside the big gum where we found One-eye. 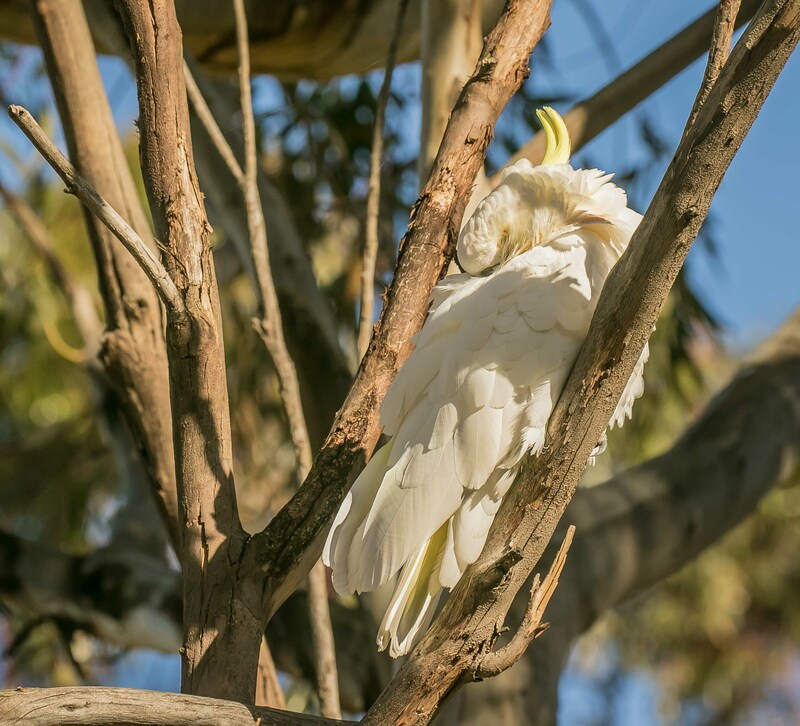 Sulphur crested Cockatoo, Elster Creek, Elsternwick – the cockatoo was fast asleep, enjoying the evening sun. 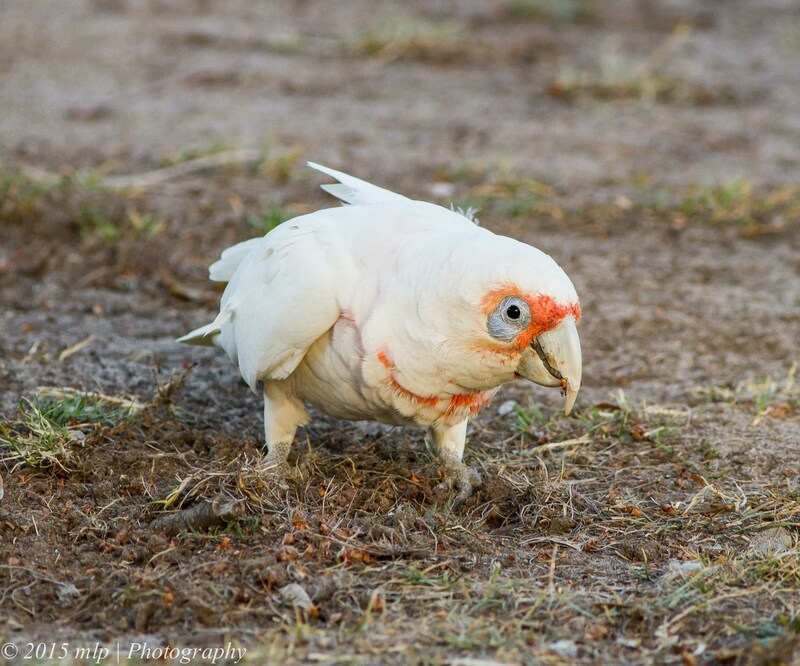 We have named this local Cockatoo, One Eye. After viewing the Spotless Crake and the Grebe for an hour or so and seeing what else turned up, we wandered over to Elster Creek and the golf course to see what was happening in a different patch of the neighbourhood. 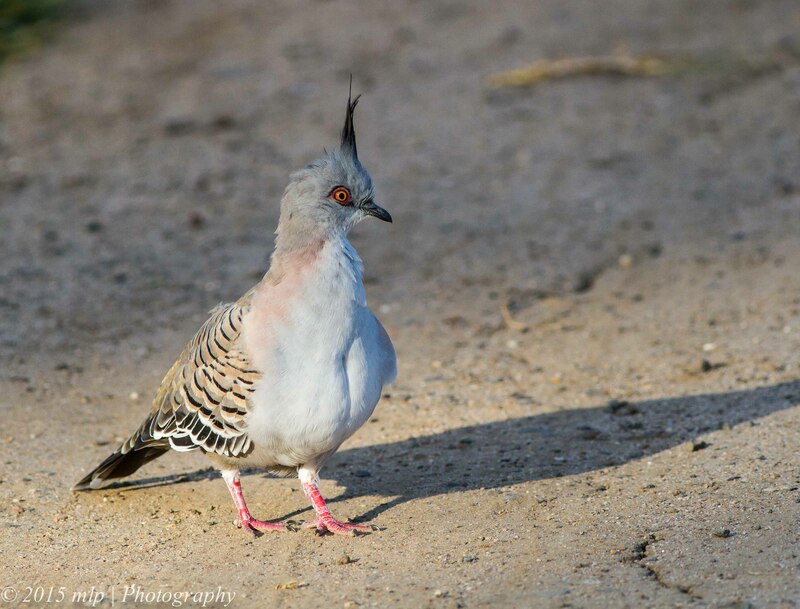 Crested Pigeons are nervous at the best of times but this one decided we were interesting (3 blokes carrying camera gear and pushing a bike) and flew down to within 20 feet or so and came strutting straight towards us. It stopped 10 feet away gave us a good looking over as I unslung my camera gear and then flew off in its usual style (mad panic). 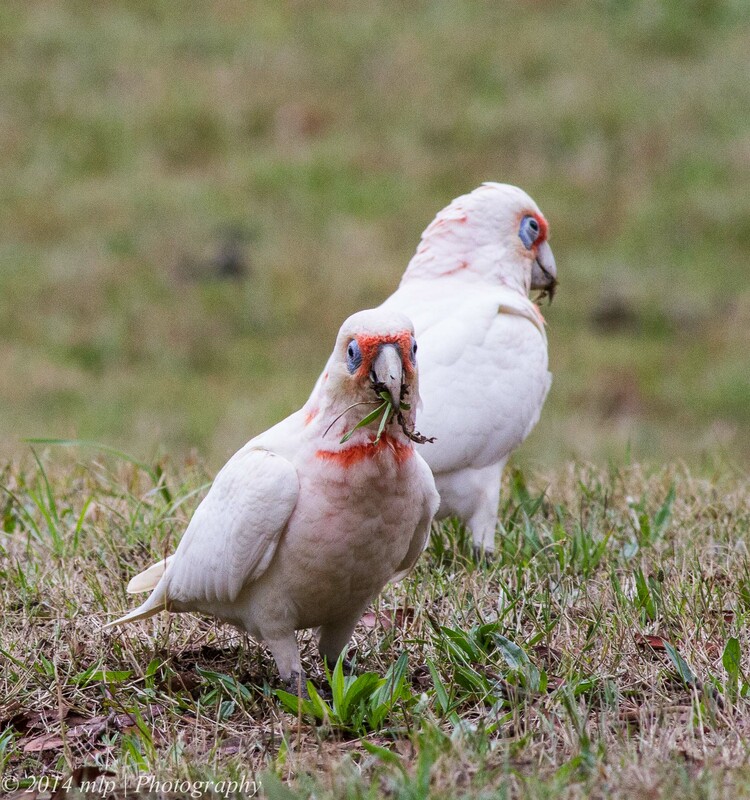 I am thinking this bird may need glasses…. 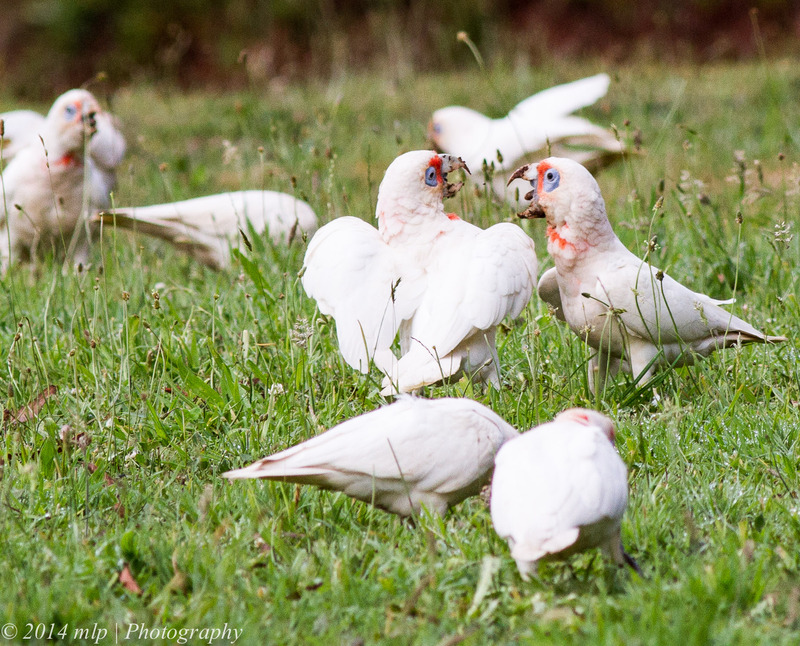 Talking of crazy birds – I spotted several Long Billed Corellas near the lake on one of the golf fairways. They were having a grand old time digging up the fairway looking for onion weed bulbs. Each one excavated a deep hole of several inches and grabbed a mouthful of bulbs and chewed them with obvious pleasure. Even walking up pretty close did not spook them. 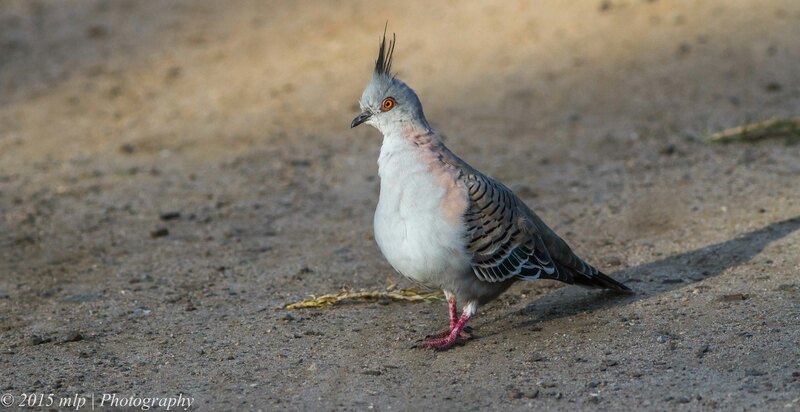 This was my first sighting of these birds in the area. 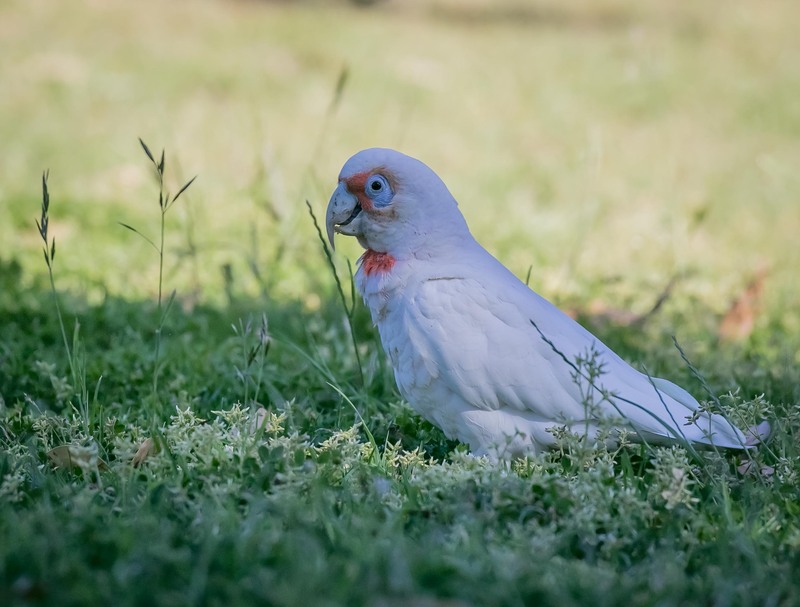 Their cousins, the Little Corella seem to be more common here especially in the last few years with a flock of 400+ roosting in the local trees over winter. 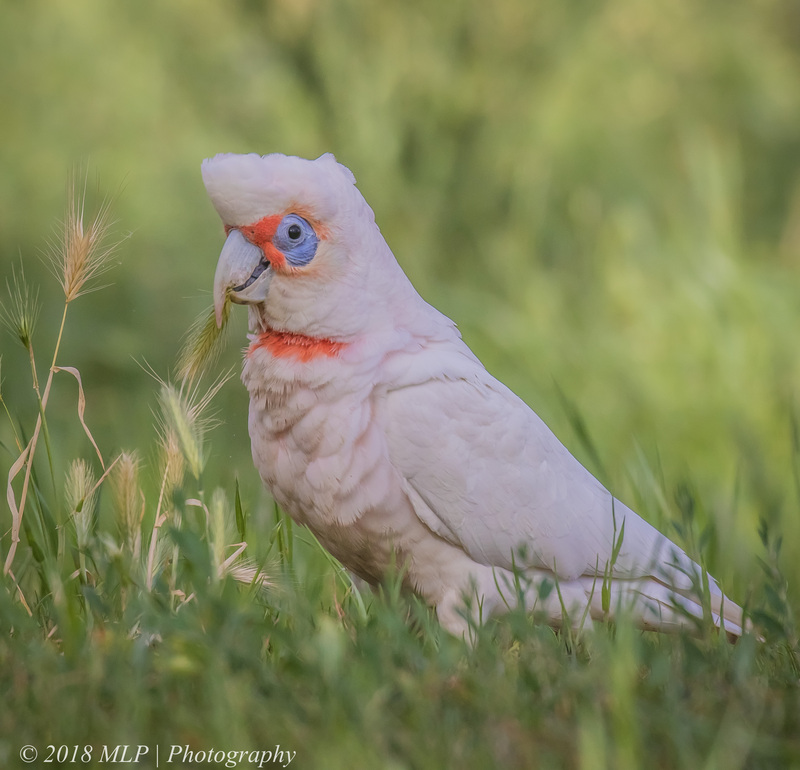 Long Billed Corella – not the greenskeepers best friend…. 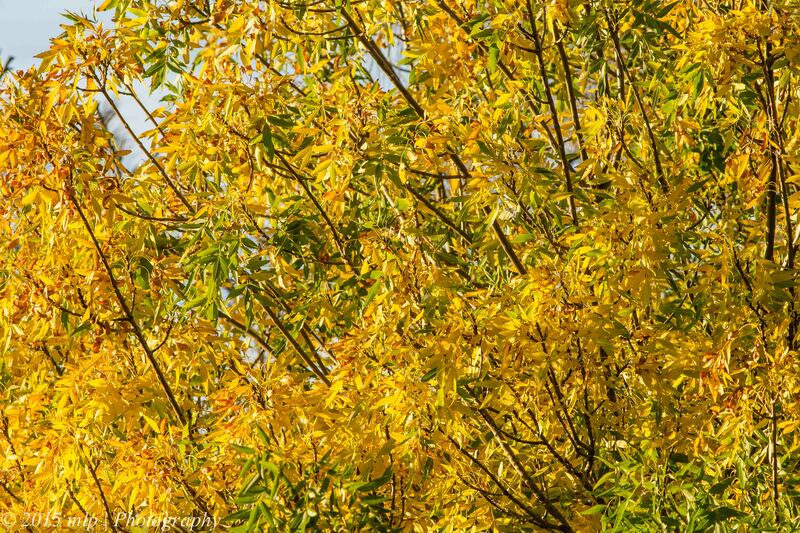 Recently I spent a few days in central Victoria around the Daylesford and Newstead areas. 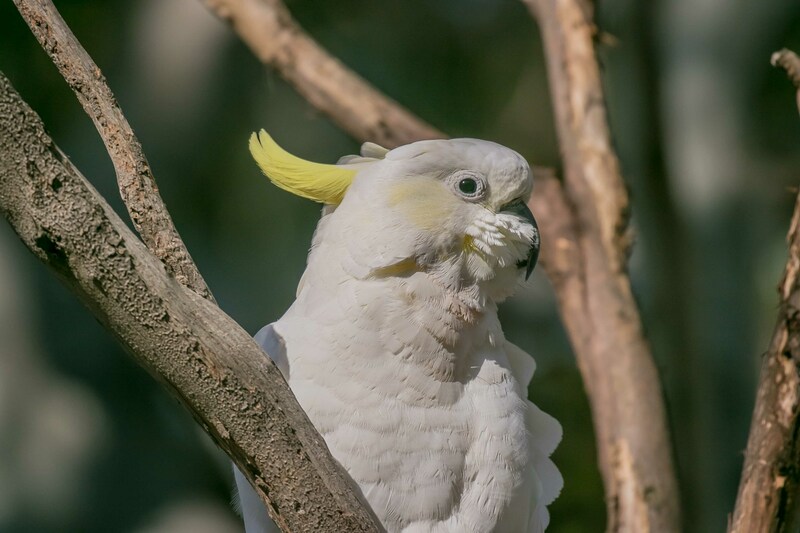 I saw quite a few Long Billed Corellas ( a type of white cockatoo). 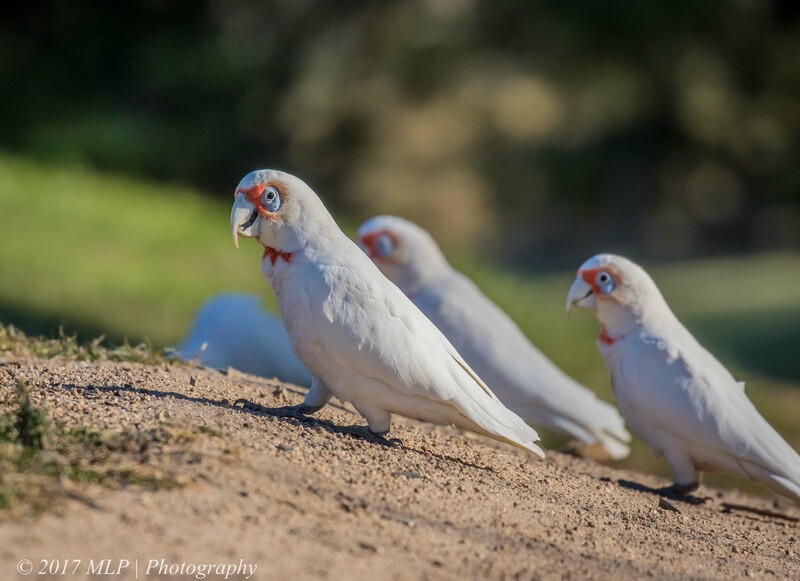 There are two types of Corellas that we can find in Victoria – The Long Billed and the Little Corella. 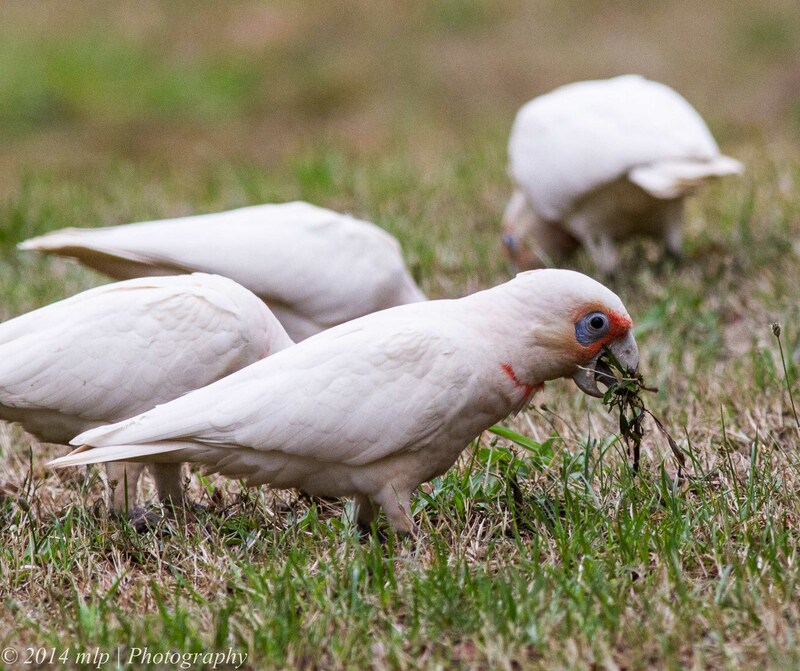 (Little Corellas can sometimes be found within the flocks of Long Billed Corrella as well as in suburban and country areas. 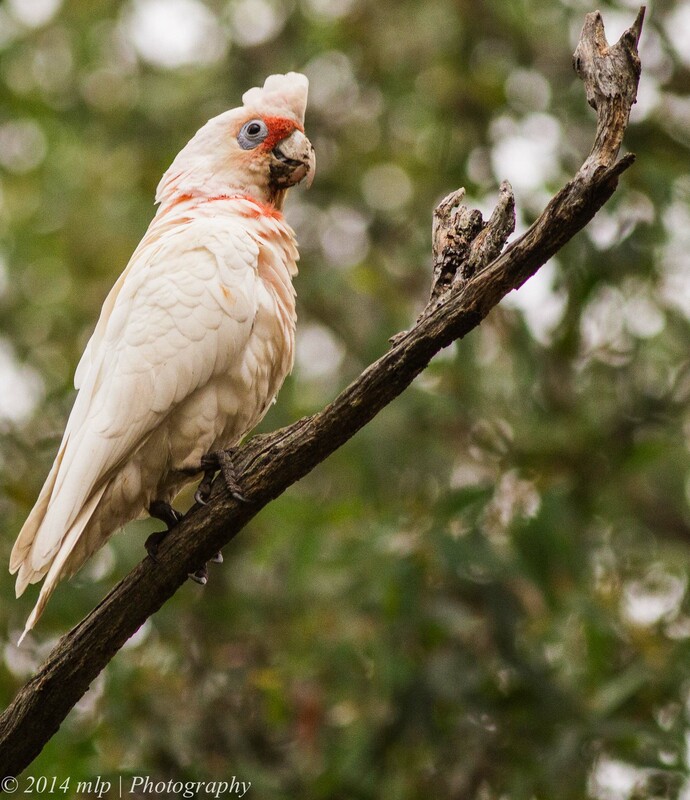 Last Summer we had over 400 in our neighbourhood that roosted in the large Gum trees each night.) 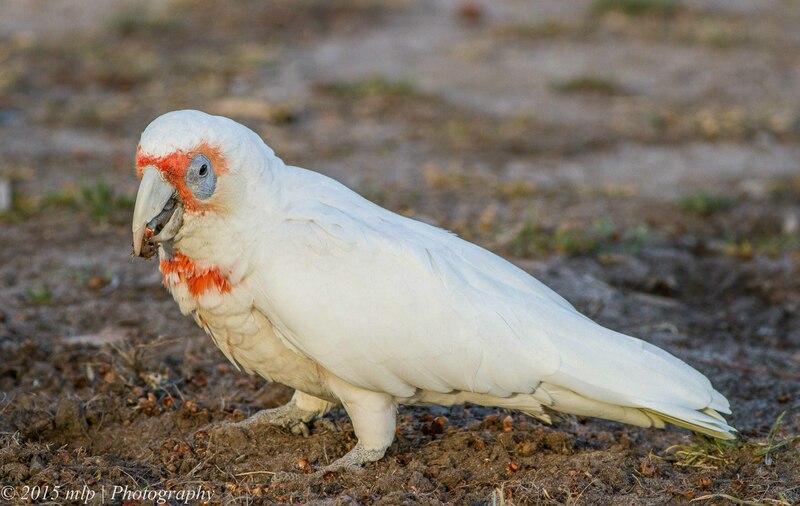 The Long Billed Corella tend to be found in the open dry country areas. 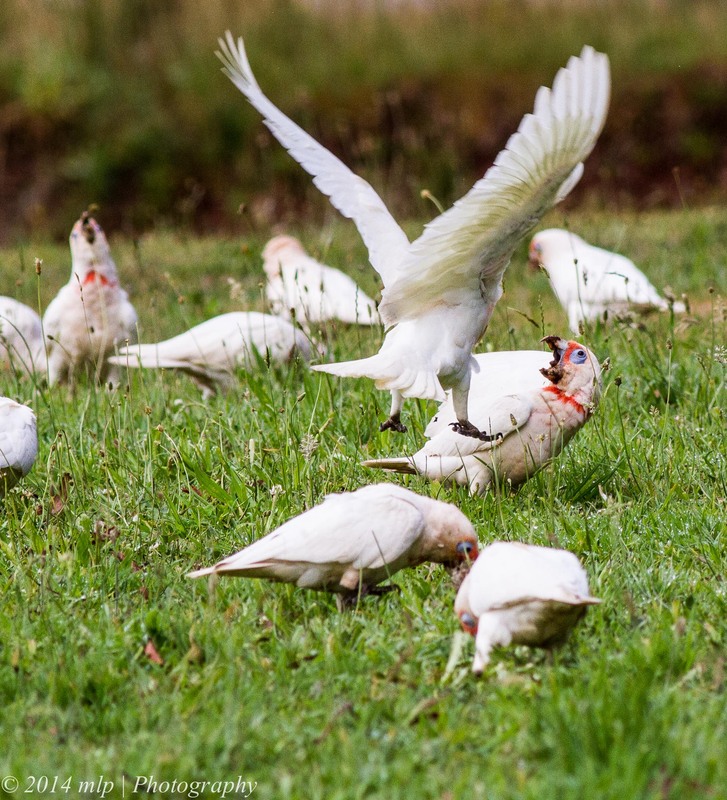 The flock of Corellas below were in a farmers paddock and at the Jubilee Lake Caravan Park outside of Daylesford. 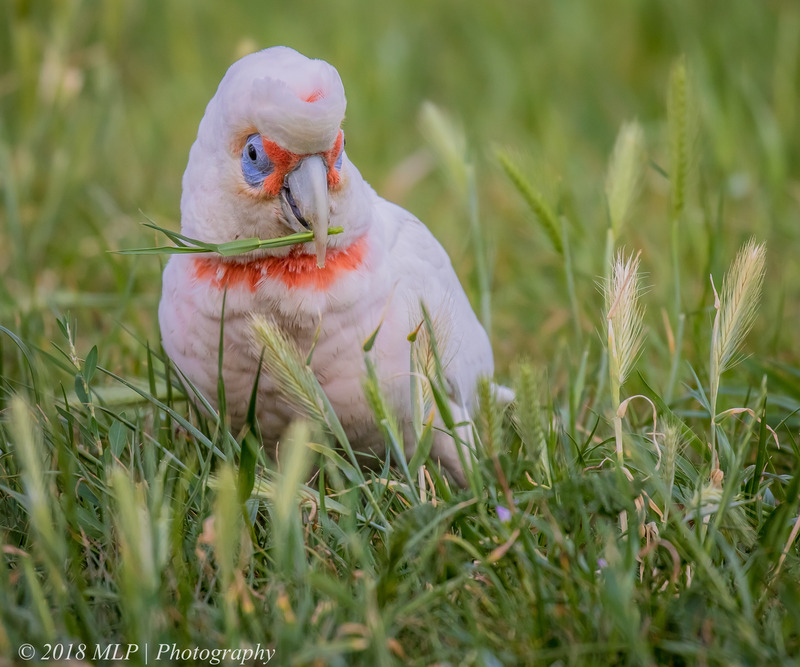 They are a gregarious bird with a lot of personality and quite fun to watch for a while as they feed, quarrel and move around. 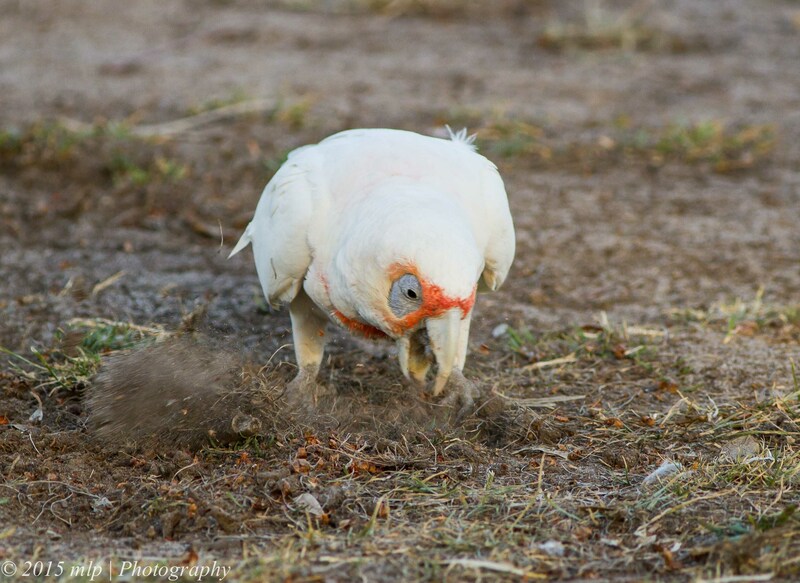 The sharp long bill is used to dig up weeds and grass to get access to the roots. 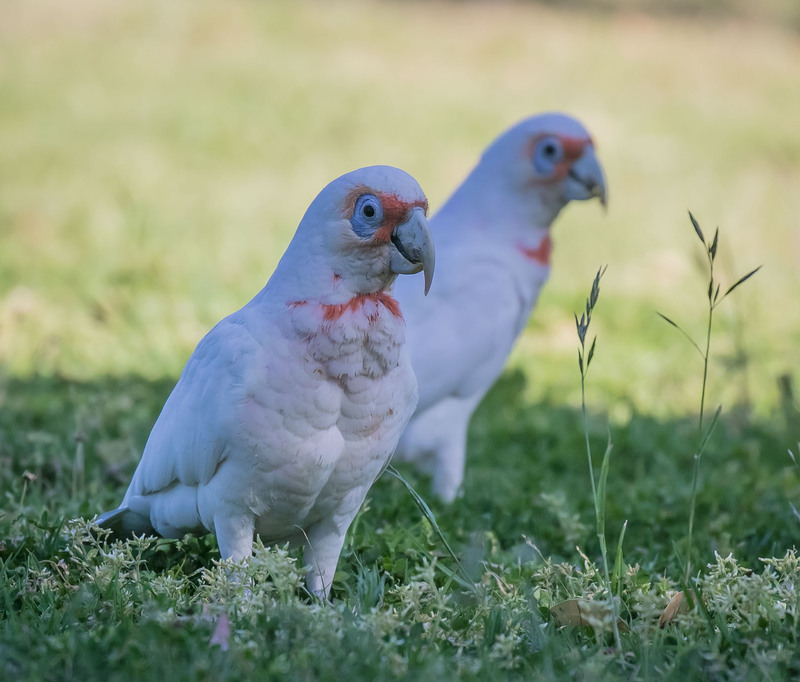 They can damage a football or cricket oval quite quickly and extensively as they move around in flocks of several hundred. The can make quite a noise as well.